CINCINNATI--(BUSINESS WIRE)--Today the Procter & Gamble Company (NYSE: PG) joins with the Humane Society International #BeCrueltyFree campaign, to ban animal testing for cosmetics in all major global beauty markets by 2023. The #BeCrueltyFree campaign was launched in 2012 with the aim of extending the European Union’s legal precedent – banning cosmetics animal testing and the sale of newly animal tested cosmetics – to countries where this practice is still allowed or even mandated by law. 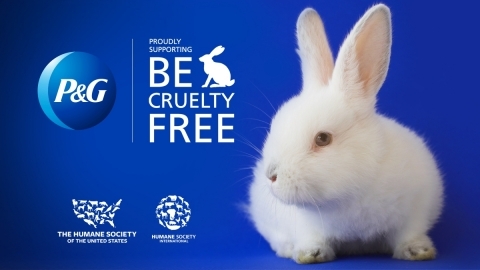 P&G’s support for #BeCrueltyFree will include joint education and capacity-building programs for non-animal alternatives, continued development of new animal-free approaches to safety assessment and advocating for the legislative end of cosmetic animal testing in key global beauty markets. Humane Society International and its partner organizations together constitute one of the world’s largest animal protection organizations. For more than 25 years, HSI has been working for the protection of all animals through the use of science, advocacy, education and hands-on programs. Celebrating animals and confronting cruelty worldwide – on the web at hsi.org.